The axis deer have gorgeous coloring and are in high demand for decoration or furniture upholstery. When we say that they are used for upholstery, we mean backs of chairs or rarely used furniture. Please note that deer have a hollow hair and are not ideal for rugs. If you walk on them or let a large dog sit on them, the hair will break and shed over time. They are ideal for wall mountings, floor displays that are not walked on, etc. Axis deer are also known as Chital deer, Cheetal deer, and spotted deer. Note that the Axis deer have spots on the spine and fallow deer do not. The medium hides are 30" to 40" long and the large hides are 40" to 50" longfrom the tip of the neck to the base of the tail. Tails are not included in the measurments. Hides may or may not include tails. Please see the gallery below for hides available for sale. The axis deer hides from the USA are alum tanned. Genus and species: Axis axis. Ranch. Axis deer are not endangered and are not subject to CITES controls. The animals are not killed just for their skins. These deer were hunted for meat. The skin is saved and tanned. These axis deer hides are harvested in their natural habitat in the Texas hill country. Therefore NO axis deer hide is perfect. ALL animals in the wild get scratches and scrapes, etc. We do our best to sew any holes in the usable part of the hide. For furniture, that is across the front legs, across the back legs and where the spots form a stripe on the belly (anything inside that) as if you laid a chair back pattern on the hide. There is no need to repair holes outside what will be used for a chair back. All hair on hides will shed with use. This is completely normal and un-avoidable. We recommend that you place the hide on areas that will not be in heavy use to extend the life of the hide. 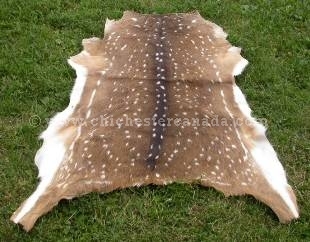 These hides are professionally tanned so there is no need to do anything else to the hide. For storage, we recommend that you do not fold the hides, rather roll them up from neck to tail with the hair out, or lay them out flat on top of each other in a moisture free environment. This keeps the hair from matting. Like us, each animal is the same but slightly different. Color, hair length, and texture will vary between each animal. Reprinted with permission from our supplier of these hides.